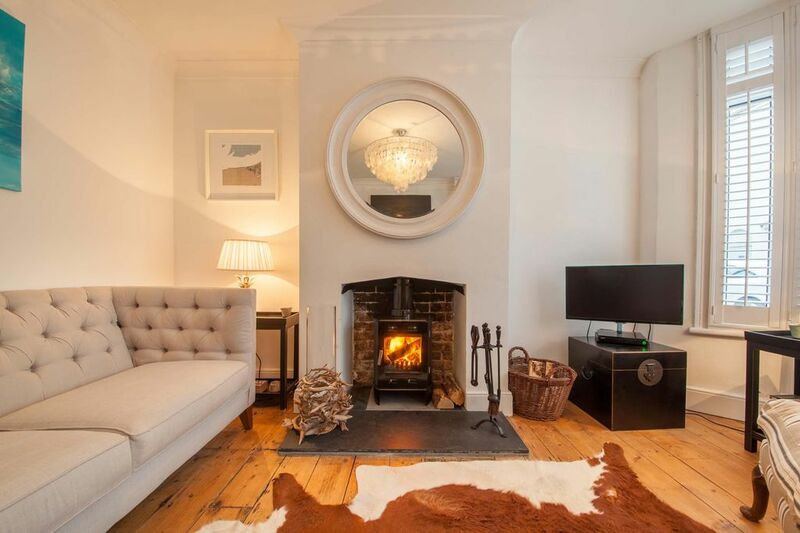 Sanderling Cottage - cosy cottage in the heart of Whitstable! Sanderling Cottage - 2 bedroom cottage for up to 4 guests! This is a lovely 2 bedroom fisherman's cottage in the quiet street of Whitstable which makes it quiet but close to all the amenities. The trains run regularly from London to Whitstable and the train station is no more than a 10 minute walk. There are buses running every 15 minutes to nearby towns so why not explore the stunning Cathedral at Canterbury or the towers at Reculver. In House Facilities - Central heating, linen and towels, kettle, toaster, fridge, gas cooker with electric oven, washing machine, TV, Wi-Fi, DVD, garden. Local Facilities - Facilities within 300m include car park, beach, high street, bus stop, play park, library, sailing/ windsurfing club, art galleries, shops, restaurants, bars, coffee shops, tennis courts. This property is perfect. Situated steps from the high street and only a few more to the seafront. Very well equipped and spotlessly clean. Beautiful bed linen and cosy throws. The open fire was very welcomed and so easy to light too. Whitstable has many excellent eateries and individual boutique shops to enjoy. Parking on this street can be tricky as it's fairly narrow and spaces along the road are limited. Thanks Whitstable and Daniel for a very relaxing weekend, we will definitely return to this fantastic property. Property not thoroughly checked before rented out. Serious leak from shower which spoilt our holiday. We had the most wonderful and relaxing stay. Cosy, comfortable and welcoming. das kleine Reihenhaus hat unsere Erwartungen erfüllt. Parken war schwierig und die Treppe war ziemlich steil. Short Breaks are calculated as a % of the weekly rate, with 2 nights starting at 50% of the weekly rate.